On our way to go Snowmobile Saguenay Lac St Jean, we drove north from Quebec City. Our Triton Trailers crested a huge slope and suddenly we left civilization behind. As far as we could see, the parallel ribbons of asphalt of the newly four-laned Highway 175 wound through the vast panorama of hills and valleys that are part of the Laurentian Highlands. For the next two hours, we drove feeling awed and dwarfed by the magnificent, larger-than-life backcountry known as the Land of Giants. Then, just as unexpectedly, we crested another rise to discover Saguenay–Lac-Saint-Jean laid out before us in a huge basin formed in the Canadian Shield. In the blink of an eye, we had arrived at this amazing oasis in the wilderness for our Quebec snowmobile tour. It’s a thriving, vibrant region with a population of almost 275,000 and lots of industry and commerce. And most important to us, the snowmobile tour staging hub for over 3,500 kilometres of world-class FCMQ trails on our go snowmobile Saguenay vacation. 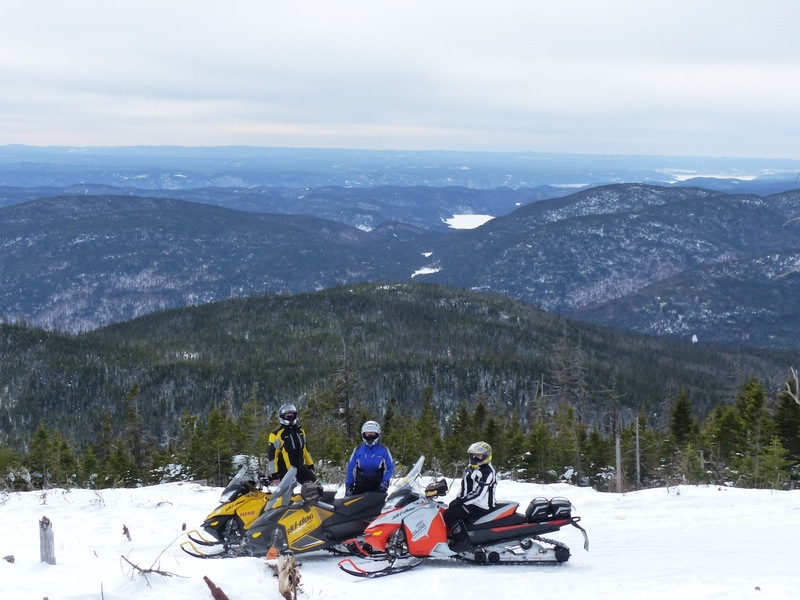 Snowmobiling is a way of life in Saguenay–Lac-Saint-Jean, Quebec. That’s because the elevation and latitude continually generate plenty of reliable snow conditions. So their Quebec snowmobile tour season can start as early as November and last well into April. That’s why they take sledding very seriously here. For instance, both of the major bridges on Regional Trail 367 over the Saguenay Fiord have a single lane exclusively for snow machines to cross. There is also a traffic light at either end to signal when it’s your turn to go. Maybe this preoccupation with snowmobiling also explains why there are more connections from the region to the outside world by snowmobile trail than there are by provincial highway. I bet there could also be more kilometres of groomed trails than paved roads within Saguenay–Lac-Saint-Jean. Our mission was to ride as many as possible…as we did on another Saguenay tour (view snowmobile video below). 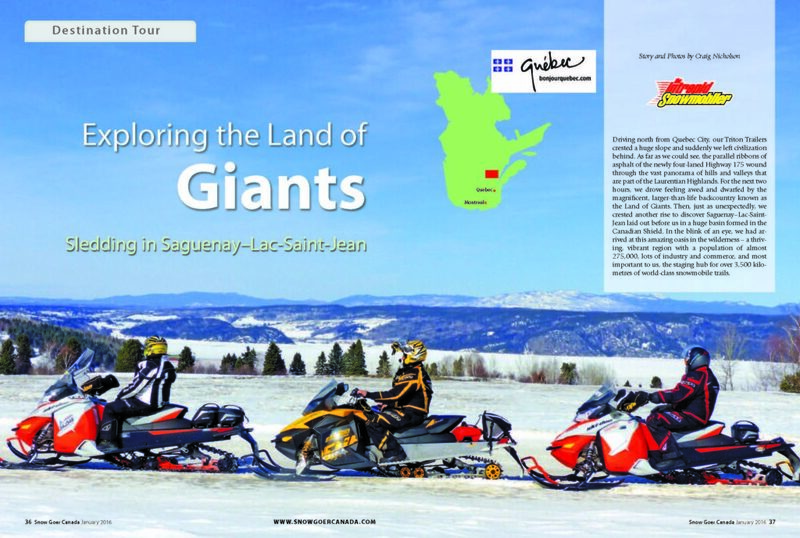 Our snowmobile magazine crew – Johnny Biasi, Jim Reavell, Tony Robinson, Trish Robinson and my wife, Marsha, and I – snowmobiled this Land of Giants for a five-day Quebec snowmobile tour. On previous visits to Saguenay–Lac-Saint-Jean, I’d passed through on a one-night stay-over as part of a longer saddlebag tour. I’d even done a saddlebag ride, destination to destination within it. But some snowmobilers might prefer the ease and comfort of trailering in and staying at the same location every night. So that’s what we did for this Quebec snowmobile tour, staging day rides out of the Delta Saguenay Hotel in Jonquière. Prominent geographic features define almost everything in Saguenay–Lac-Saint-Jean. The 105-kilometre Saguenay Fiord cuts the region in half, north and south. The Saguenay begins at Lac-Saint-Jean. With its huge size (43.8 km long by 24 km wide, it’s the same size as Lake St Clair in the Great Lakes). This lake effectively defines the western limits of most urbanization and industry in the region. But the flatlands around its perimeter provide prime agriculture, especially commercial blueberry crops. Then there’s Monts-Valin. This is a range of massifs located on the north side of the Saguenay Fiord. It’s about 35 kilometres northeast (as the crow flies – more like 55 by trail) from the south side towns of Chicoutimi and Jonquière. These two centres, plus others such as Alma, La Baie and Roberval, anchor the south side of Saguenay–Lac-Saint-Jean. The north side tends to be more sparsely populated, with villages sandwiched between the fiord and the mountains. Meanwhile, the whole of Saguenay–Lac-Saint-Jean is coralled by wilderness. Most local roads end not far past its populated areas – unlike their FCMQ snowmobile trails, which penetrate farther into the backcountry. These geographic characteristics also define the sledding opportunities of Saguenay–Lac-Saint-Jean. These fall into four main categories. Option one, forested hill country riding south of the fiord from the towns of Laterrière and La Baie east to L’Anse-Saint Jean. Here, main trails Trans Quebec 83 and 383 are meandering old logging roads. Option two, forest and field running on the flatlands around Lac-Saint-Jean on main trails Trans Quebec 83, Trans Quebec 93 and Regional Trail 373. This includes the ride around Lac-Saint-Jean itself. It’s a minimum 407-kilometre loop that can easily be extended with a few side trails into a longer two-day expedition. Option three, wilderness trail riding north of the fiord in both Monts-Valin East and Monts-Valin West. This occurs on main trails Trans Quebec 93, Regional Trail 328 and Regional Trail 367, plus a bunch of more northerly and remote secondary trails. 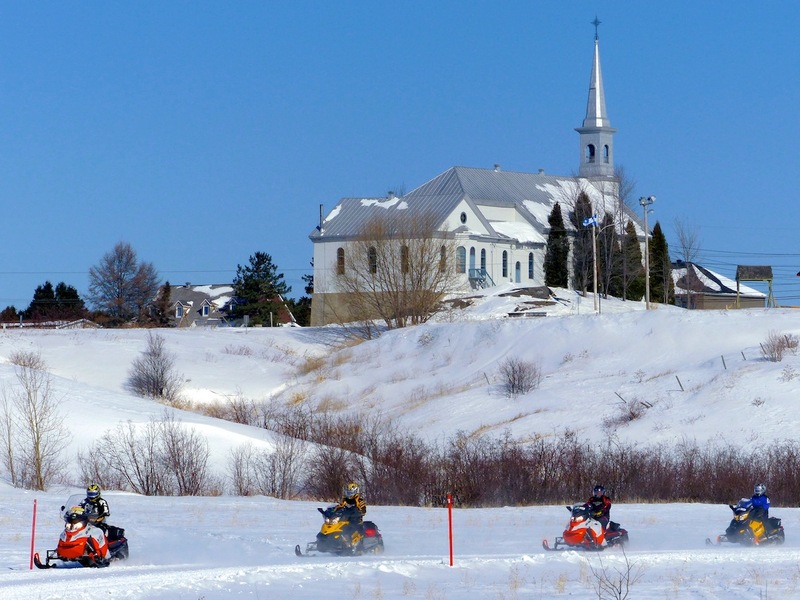 Where the official FCMQ snowmobile trails end, you can go even father north. Take a day’s ride on a private trail system operated by the Club de Motoneige Onatchiway (buy a permit and enter this system at Relais Onatchiway). Monts-Valin East also includes the popular “Summits Circuit”, with trails leading to scenic lookouts on the area’s five highest peaks. And option four, backcountry riding in Monts-Valin East. Here, long tracks and deep lugs are a must for playing on the powdery slopes and bowls. See my Monts-Valin tour article for more info. 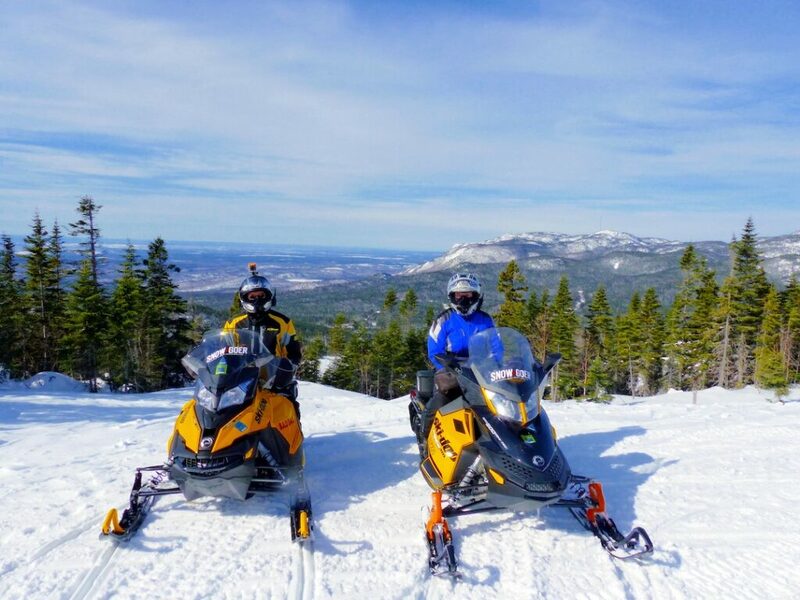 Without a doubt, you’ll find a good, old-fashioned winter in Saguenay–Lac-Saint-Jean for your Quebec snowmobile tour. In our five days of riding, we experienced temperatures of +2˚ Celsius and (feels like) -28. We rode through a day long, raging blizzard, with white outs and snow blowing all over the place. We rode fresh powder on the trails and did some serious drift busting another day. It was brilliantly sunny with incredible blue sky on some days, overcast on others, and perfect sledding temperature, between -15˚ and -6˚ Celsius, for others. The consistent factors every day were lots of snow and well groomed trails everywhere we went to go snowmobile Saguenay. 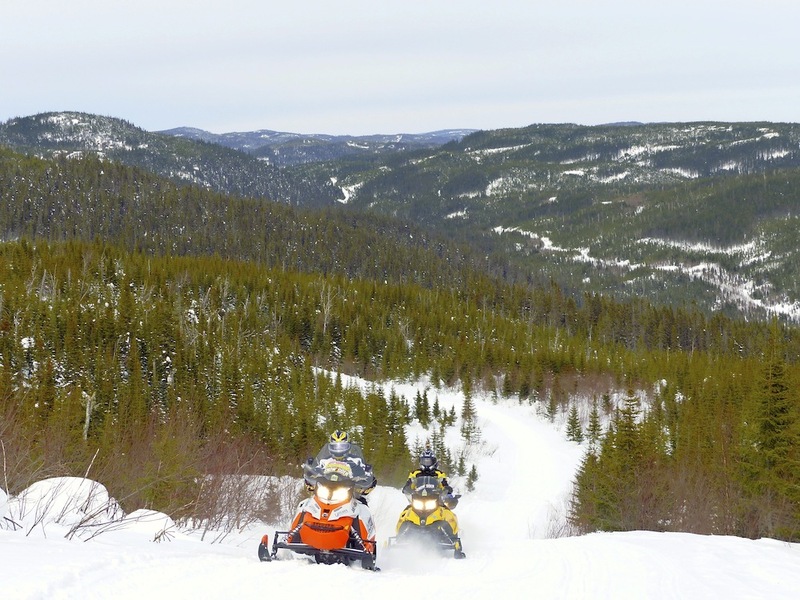 The go snowmobile Saguenay experience is well worth travelling the extra distance. From the Greater Toronto Area, it took us about 10 hours on four lane expressways all the way – quick and easy trailering. 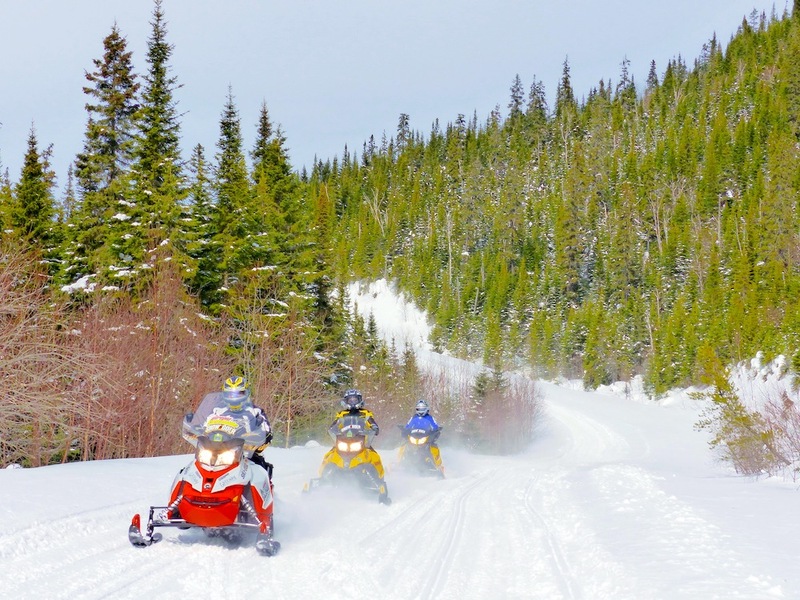 By sled, each of the access trails running north from Trans Quebec 3 (parallel to the St. Lawrence River) – from west to east: Regional Trail 355, Trans Quebec 23, Trans Quebec 83, Regional Trail 383 and Trans Quebec 93 – are very enjoyable rides with some great scenery along the way. And once you arrive in Saguenay–Lac-Saint-Jean, you have a multitude of trail choices. Tailor each day’s ride to suit your time, mood, energy and group size & preference. You’ll note some of these sledding options in the following “Our Itinerary” section, but there are many others, too. Delta Saguenay Hotel. The Delta Saguenay Hotel locates itself centrally on the south side of the Saguenay Fiord near several major trail intersections (#19 on the 2016 Trail Guide). A towering 10 stories, it’s the tallest building in the area and easy to spot. 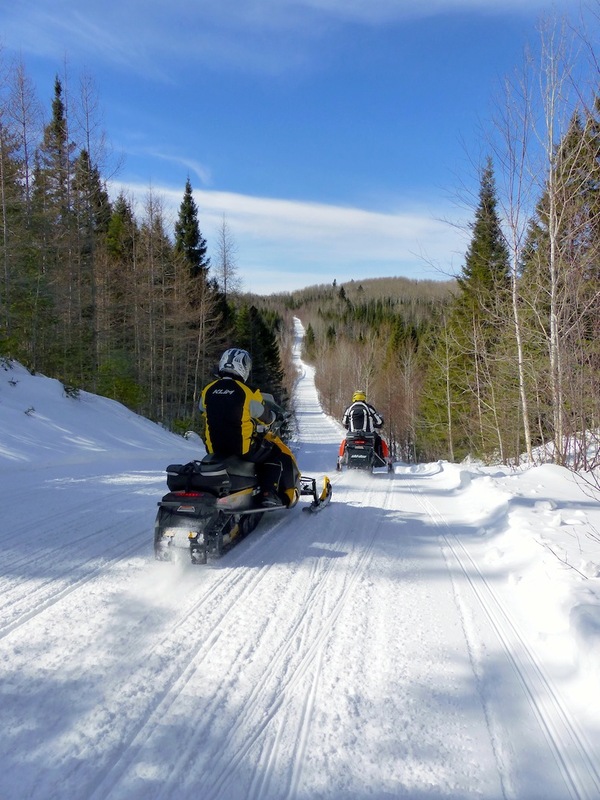 As well as direct trail access, the Delta Saguenay provides its snowmobiler guests with both secure sled and truck & trailer parking (locked compounds with video surveillance). There’s also a trail accessible gas station/convenience store next door, along with both a McDonalds and Tim Hortons. The Delta Saguenay Hotel greets its sledding guests with a complimentary glass of hot Caribou. That’s a sweet Québécois alcoholic beverage composed of red wine, hard liquor (usually whisky) and maple syrup or sugar. After check in with their super friendly, English-speaking reception staff, we loaded our gear on one the of the available luggage carts. Then we took one of the elevators to our recently refurbished room. From there I was able to keep an eye on both our sleds and vehicles from our window (Even numbered rooms face south – the right way). The Delta Saguenay Hotel offers a snowmobile package in their on site Tendance Restaurant. It includes a very generous all-you-can-eat buffet breakfast with everything from fruit and yogurt to oatmeal and a variety of hot entrees plus many breads, muffins and pastries. Tendance also offers a specially priced snowmobiler’s dinner menu. Best of all, the double rooms we enjoyed at the Delta have new Queen size beds. They ensure a great night’s sleep after a long day on the trail and a nightcap at the hotel bar. 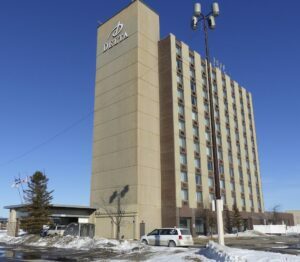 As an overnight stop on your saddle bag tour or as a staging hotel for multiple day rides of Saguenay–Lac-Saint-Jean, the Delta Saguenay Hotel is a great place to stay for your go snowmobile Saguenay tour. We rode 220 km eastern loop along the south side of the fiord via TQ83, RT383 & TQ83. Fuel: Saint-Félix-d’Otis. Shorter Options: Ride 186 km via TQ83, RT383, LT22 & TQ83 or 152 km via TQ83, RT383, LT21 & TQ83. Due to day long blizzard, we only rode 175 km of planned western loop east of the lake via RT383, TQ23 (to Alma), TQ23 south to TQ83 back to hotel. Lunch: Alma, Fuel: Hébertville. Intended Ride – 291 km western loop south of the lake via TQ83, RT383, RT368, TQ23, TQ83, LT602, LT601, LT603, TQ83, TQ23, RT383, TQ83. Longer Option: 270 km via TQ83, RT367, LT134, TQ93, LT267, LT477, LT484, LT482, RT367, TQ83. We rode 290 km northwestern loop north of the lake via TQ83, RT383, TQ23, TQ93, LT900, LT902, RT367, TQ83. Fuel & lunch: Saint-Ludger-de-Milot. Like This Post? Follow Me on Facebook! Check out more snowmobile tours! The tips and advice in this blog are the opinions of the author, may not work in every situation and are intended only for the convenience and interest of the reader, who has the personal responsibility to confirm the validity, accuracy and relevancy of this information prior to putting it to their own use.